Yvon Chouinard is the founder of Patagonia, an outdoor gear and clothing company. Chouinard began making his own gear for rock climbing back in the 1970s, and quickly began selling it to his friends, before expanding further to a larger (and larger) market. 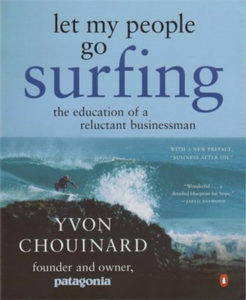 Chouinard touts himself as a “reluctant businessman,” and carries this theme throughout every story and lesson in the book. His philosophy is that employees should have the freedom to take off in the middle of the day to go surfing, as long as you show that you trust all of their work will be completed (a “results only” work environment). We chose this book to highlight that philosophy, as it is one that we also subscribe to. The ability to fit your work schedule around your life, and not your life around your work, allows people to work when it is not only most convenient, but also at times when they may be more productive. Patagonia also strives to be a very environmentally-friendly company, often going to great lengths to create a sustainable product that leaves behind only a small impact. We related to this aspect of his business model, as many of our philosophies match Chouinard’s especially in terms of growth, reinvesting in the company, and putting forward a company that embodies who its employees are. Despite his life-long reluctance to be a businessman, Chouinard has built an incredibly successful company, and seems to have a solid business plan that not only fits the company, but also the employees. And while the level of freedom that the Patagonia employees maintain certainly seems unattainable in most environments, we have been fortunate that a similar philosophy has worked for us for over a decade. We believe in the importance of a flexible schedule to fit our employees lives, and have found that the results of this business model are beneficial to both the company and the individuals. Chouinard, Yvon. Let My People Go Surfing: The Education of a Reluctant Businessman. Penguin Books, 2006. Subscribe to our email list for updates on new products and services!